Discussion in 'Online Casino Promotions' started by Kotsy, Dec 7, 2013. The Christmas celebration is in full swing at iNetBet Casino. Enjoy 12 Days of Christmas with some fantastic promotions that include free spins, deposit bonuses and more. Promotion is based on the Christmas carol 12 Days of Christmas. Every Saturday in December, a new weeks worth of promotions will be valid. Each and every day will be something new. Let's start the 12 Days of Christmas off. Starting December 7th, players have the following promotions available that include a free chip. -A Partridge in a Pear Tree offers a 100% deposit bonus with coupon code Q4K4F valid until December 31. -Two Turtle Doves and a $20 challenge chip with coupon code CKHCM valid until December 31. 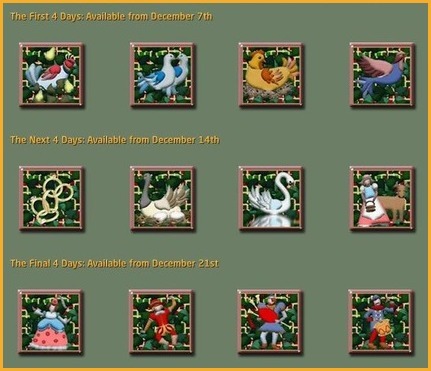 Enjoy the first 4 days of 12 Days of Christmas. Each day the promotions have specific terms and conditions.